Since the focal lengths are different, I cropped images and resized them for your viewing pleasure. 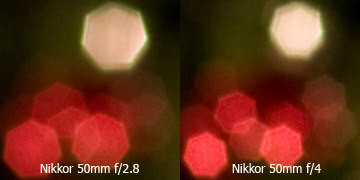 It is hard to compare bokeh on these lenses because it is impossible to measure them all with the same focal length. Also, the lenses vary in maximum/minimum aperture and good bokeh can only be achieved when the aperture is set to the maximum (lowest f number), meaning shallow depth of field. Focal length also plays a big role as can be seen with the 105mm VR. All pictures were taken at ISO 200 (D300 native) with default camera settings without any post-processing, VR was turned off. Nikkor 50mm f/1.4 – good to excellent bokeh, depending on aperture. Shows heptagon diaphragm as bokeh, which most people don’t mind and some even like. Nikkor 12-24mm f/4 DX – no bokeh on this lens considering max aperture of f/4 and lens being ultra wide. This lens is used primarily for landscape photography where bokeh is not needed. 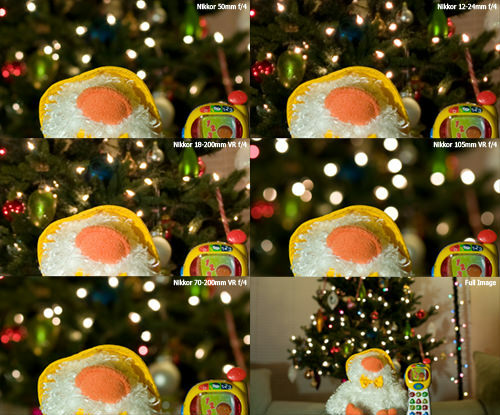 Nikkor 18-200mm f/3.5-5.6 DX VR – very bad bokeh at all focal lengths. 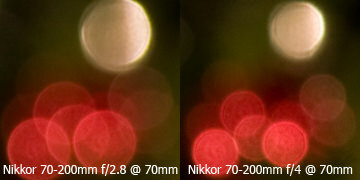 As focal length increases between 50mm to 100mm bokeh gets slightly better, but that’s about it. Nikkor 105mm f/2.8 VR Micro – excellent bokeh with some flare and ghosting. Try to use the lens hood all the time with this one. Nikkor 70-200mm f/2.8 VR – superb bokeh with some flare and ghosting. Always use this lens with the hood. Fahim, do next expect the Nikon 18-55mm to yield beautiful bokeh, it is not a lens for that kind of photography…you need a fast aperture lens or a telephoto lens to produce good bokeh. Hows nikon 50mm f1.8 D (old model without autofocus) for bokeh? I currently have a NIkon D90 with a 18-55mm 3.5-4.5 lens. I would like to shoot indoor sports, low lighting in rooms, I like to play with bokeh. I’ve been thinking of the Nikon 50mm 1.8 D or the new G; or the 70-200mm variable aperture zoom; or the Nikon 85mm 1.8 D. What would you recommend? An amazing post you have here ! I want an amazing bokeh quality for the portraits. Out of the Nikkor 50mm f1.4G and the Nikkor 105mm f2.8 micro, which one do you recommend ? Your opinion would be greatly helpful. I have a Nikkor 18-200mm f/3.5-5.6 DX VR using in D80. I know the bokeh is bad and want to buy another zoom lens used in travelling for taking people and landscape . Can you recommend a zoom lens that have the good bokeh ? Is 17-55mm suitable for me ? I know this lens is a DX lens. I may change to a new camera body in the near future. Can this lens also used in a FX camera ? Also the 85mm f/1.4 D and another one is the 135mm f/2.0 AF DC again I’m looking to buy THE BEST BOKEH NIKON LENS, please if you have time and look on this video, look what this person says on the 3:58 min “This is the King of Bokeh”, www.youtube.com/watch…wbQ8k7twX8 Thanks for all the explanation and information you have posted in your website. Crank your lens out to 300mm and move as close to the subject as you are able to focus (every lens has a minimum focus distance for each focal length*). Then back away a couple of feet. Take your photograph. Call this shot #1. Now bring your lens back in to 55mm, then move close enough to your subject to get almost the EXACT same framing you had at 300mm. If you cannot frame it closely enough, because you are too close to focus, then you were too close for shot #1 and you’ll have to retake it, but back up a little bit. The objective is to frame the object exactly the same way at both focal lengths. OK, got the same framing, take your photograph. This is shot #2. Now compare shot #1 to shot #2. I think you’ll see clearly the differences in the background. I did not tell you to worry about your f-stop or any other camera settings. They should meter the same, since it’s the same subject and same framing, but even a massive variation in f-stop should not have a significant impact here because we’re talking about 300mm vs. 55mm*. Now you are a self taught “bokeh” expert! I think Nasim’s other bokeh article photographylife.com/what-is-bokeh explains more about the shape of the out of focus circles related to the shape of the aperture blades. *On many zoom lenses, when you use “close focus” on the longer end, you may actually get a shorter focal length than the lens advertises. This is because the focus mechanism is shortening the focal length in order to be able to focus more closely. The alternative is to have very distant close focus which I don’t think would make many people happy. I’m not convinced this is a revealing test at all. If I came here and judged bokeh based on this test I would leave thinking the 18-200 cannot ever produce even an out of focus background. Granted, I do not own the 18-200, but I do own the 55-200 and I know that I can create extremely smooth (and fairly pleasant) backgrounds by shooting at the longer end (let’s say between 100-200) and framing fairly tightly. At 200mm even f/8 and f/11 creates extremely out of focus backgrounds for headshots and other small subjects. This seems to refute what this article is saying (“good bokeh can only be achieved when the aperture is set to the maximum”). My general rule is that the amount of background blur increases more with longer focal lengths and closer focus distances (and also the further away your background). F-stop has an impact, but much less so than focal length and focus distance. For example, I love challenging myself to take pictures with my 35mm at f/1.8, but at such a short focal length background blur is very minimal (depth-of-field is also very minimal). If I really want to throw my backgrounds out of focus, I grab my 55-200 and shoot at 200mm. Now, the bokeh may not be as pleasing on a slow $250 zoom as it would be on a fast $2,000 zoom or even 50mm fast prime, but you can get great results with consumer zooms if you take your time and pay attention to your focal length, focus distance, and distance to background. At a certain point, even with consumer zooms, your background will become a smooth velvet wall of subtle shades of color where those little circles just blend together and their quality no longer matters. Is this possible to get good bokeh with 35mm f/1.8 prime lens?